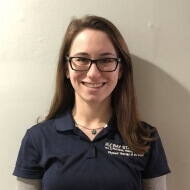 Sarah is a graduate of Quinnipiac University and received her Doctor of Physical Therapy in 2017 and her Bachelors of Science in 2014. From her clinical experiences in New York City, Sarah has experience treating a variety of conditions spanning all body systems, including orthopedic conditions, lymphedema, and torticollis in infants. Sarah treats a variety of orthopedic conditions and is especially passionate about treating the pediatric population, as well as dancers. Originally from New Jersey, Sarah grew up performing ballet and assisting at her mother’s day care center. She is very excited to be a new member of the Bay State Physical Therapy team!